“I miss my house. 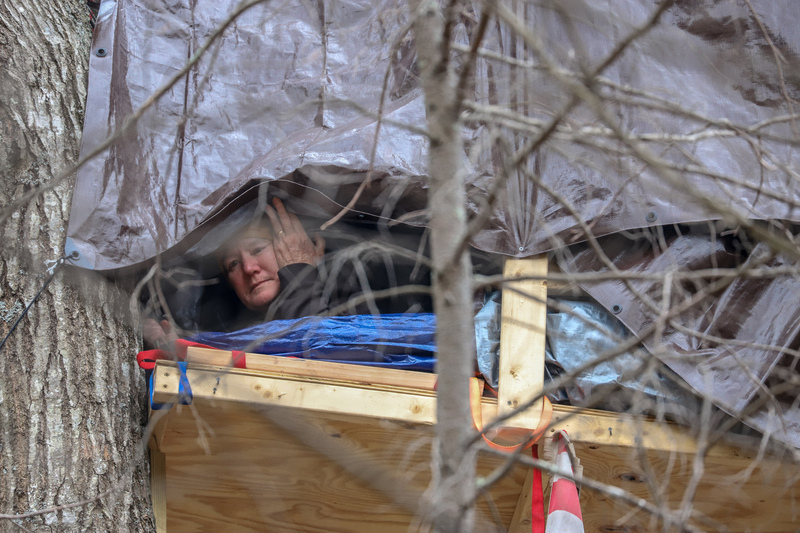 I really would not have traded it for a piece of plywood if this were not important,” shouted Red Terry, high above her property in a tree-sit on Bent Mountain this past April. Theresa “Red” Terry lives in an “active crime scene,” according to law enforcement. Along with other activists, she and her daughter, Minor Terry, are seeking to prevent construction of a 300-mile long, 42-inch wide natural gas pipeline that would cut through Jefferson National Forest. 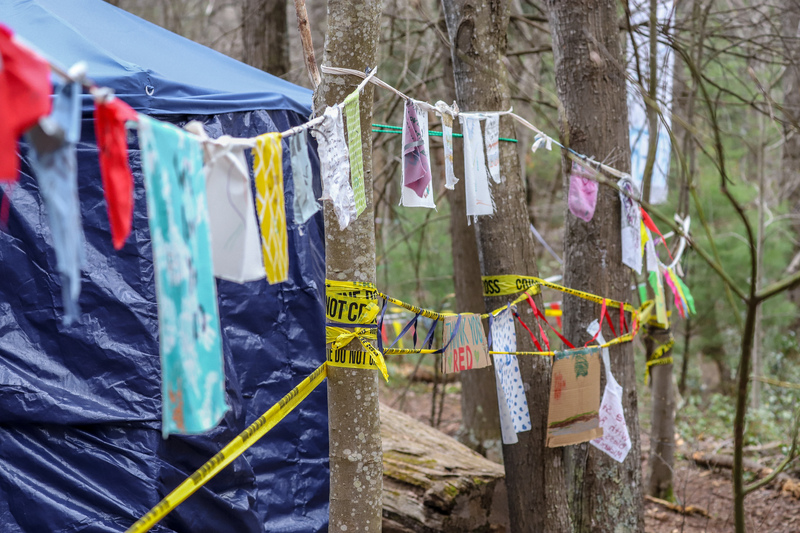 They took to the trees after an ongoing four-year legal battle that climaxed this January when a federal judge ruled in favor of Mountain Valley Pipeline, LLC, clearing the way for pipeline construction. 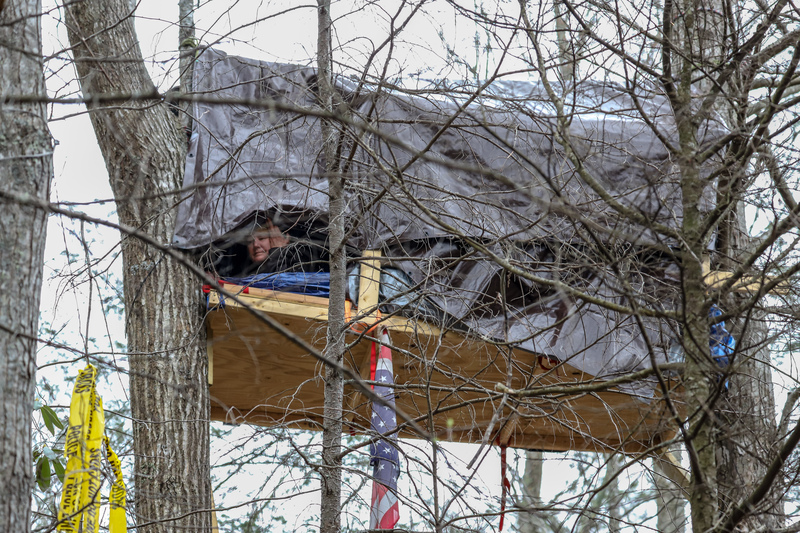 Landowners occupy shelters in the trees above their land in protest of the Mountain Valley Pipeline proposed for construction in Franklin County, Virginia. Red and Minor were found in contempt of court for their protest, and have been charged with three misdemeanors, including impeding work and trespassing. 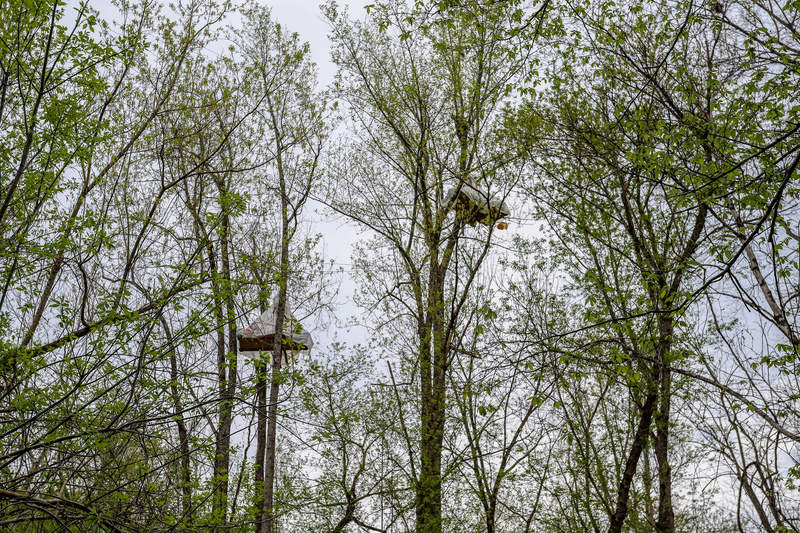 Living on separate tree platforms in two different locations, they are both near the creek that runs through their property. The pipeline company claims their protest halted tree cutting, but the Virginia Department of Environmental Quality has forbidden MVP to cut trees within 75 feet of any waterway for the season due to the spawning season of the Roanoke logperch, a federally-designated endangered species. 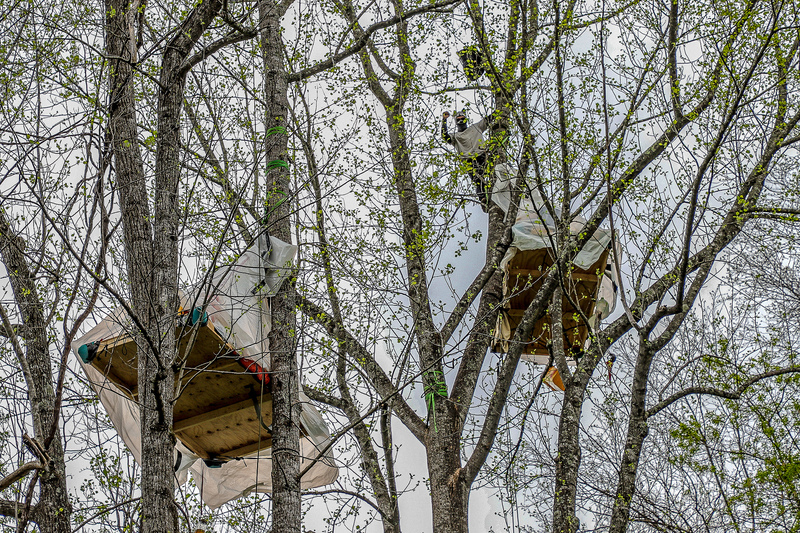 The protests gave MVP grounds to request an extension to DEQ’s original tree cutting deadline of March 31 to May 31, which DEQ and other federal agencies granted. Originally, this deadline was set to protect bat and migratory bird habitats. According to Dr. Hearst Kastning, a karst landscape expert, pipeline leaks are likely to occur due to the high degree of seismic activity in this region of Appalachia. Landslides are also common here, and Kastning says they’re likely to increase when the trees preventing erosion are removed. On Carolyn Reilly’s property, a working farm in Franklin County, an anonymous group has taken to the trees to protect her land. Reilly, a longtime pipeline fighter, faces contempt of court charges for allowing them to remain. The Reillys and the Terrys have been fighting the MVP for the past three and a half years, engaging in government meetings, community forums, and an endless string of lawsuits. Both families are part of individual lawsuits against FERC and state agencies, as well as group lawsuits through organizations like Bold Alliance, the Sierra Club, and the Southern Environmental Law Center. The process is long and messy. Many of these lawsuits have no precedent, making for a new legal environment. The process for companies is becoming more tedious since, in addition to receiving a certificate from FERC, the section 401 water quality test from the State Water Control Board, and approval from the Forest Service, they are being met with lawsuits from almost every impacted landowner. While this may be a headache for companies like EQT Midstream Partners, partners involved with MVP; or Dominion, who controls the Atlantic Coast Pipeline project; it poses more serious challenges to rural landowners who lack the resources to fight back. In 2016, protests against the Dakota Access Pipeline at the Standing Rock Indian Reservation highlighted the power that corporations wield in these interactions. While the MVP does not disrupt Native American land, the proposed pipeline will cause irreparable damage to woodlands and historic farmlands, in an area as sparsely populated as Standing Rock. Energy companies have continually targeted populations that lack widespread social power. They are small, agrarian communities that feel ignored by their political representatives and lack the resources to stop a project headed by large corporations, many of which donate to Virginia’s political parties. According to the Virginia Public Access Project, Governor Northam has accepted over $199,251 from Dominion alone, something that critics say suggests government bias. “DEQ has a history of aligning with industry over the public interest, and that was no more clear than in the agency’s industry-friendly handling of the Atlantic Coast and Mountain Valley pipeline permits in 2017,” Peter Anderson, Virginia Program Manager with Appalachian Voices, said in a statement. Last year, former Governor McAuliffe signed a $58 million mitigation plan with Dominion, releasing them from any potential damages to Virginia’s forests by the ACP, while Governor Northam remains passive toward pipeline questions, and publicly reprimanded Red Terry for her protest. Elefant predicts these cases will go to the Supreme Court. In addition to the constitutionality of a private corporation using eminent domain, several other new legal issues are introduced, such as the environmental impact inflicted by this project. In May, the Terrys had their court dates, almost a month after Red and Minor took to the trees. 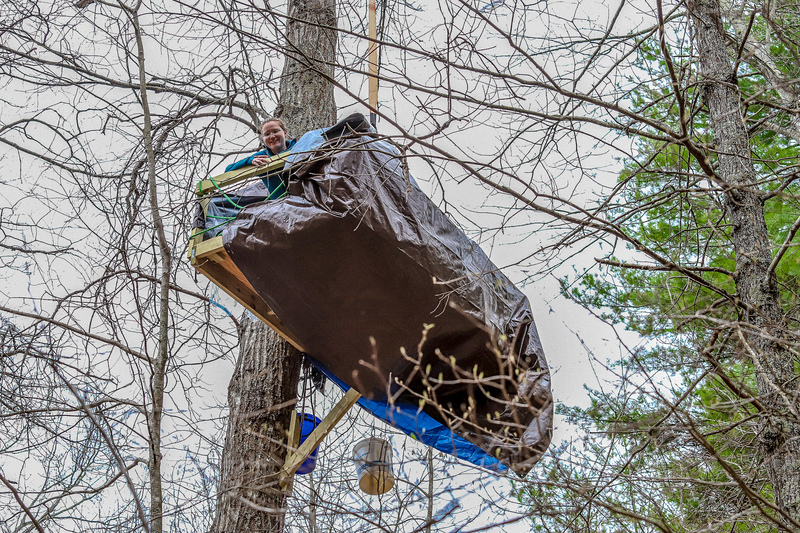 The tree-sitters believe the lengths they have gone to protect the land are absolutely necessary. They have endured rain, high winds, freezing temperatures, snow, heat, constant interrogation, police surveillance, and really bad bologna sandwiches. U.S. District Judge Elizabeth Dillon found the Terrys in contempt of court and ordered them to evacuate their trees by midnight the next Saturday. If they did not comply, they would be fined $1,000 per day – fines that would be given directly to MVP, LLC. Red’s husband, Coles Terry III, was fined $2,000 for being in contempt for supporting his wife and daughter. MVP lawyers told the judge that the delays caused by the Terrys so far have cost the pipeline more than $15,000, and that security efforts around the tree-sitting zones cost more than $25,000. MVP’s construction manager testified the alleged financial damages would grow exponentially if crews could not finish tree clearing by the May 31 deadline. Even after the ruling was reached, Alex and the others remained on the Reilly property until the end of May. Carolyn and her husband have done everything they could to protect their land and their farm from a corporate enterprise, not only affecting their lives and their children’s lives, but the entire community around them. Eminent domain has stripped them of that right, while the Reillys have to worry whether they will be able to continue farming, out of fear for their soil and waterways. Hundreds of miles away, men in a corporate office in Pittsburgh have permanently affected the way a little girl sees the world. The Reillys, the Terrys and hundreds of other landowners continue to fight both the ACP and the MVP. Both projects continue to face considerable obstacles, such as mid-May storms, which prompted DEQ to cite environmental violations and halt construction due to severe erosion that would pollute waterways. MVP predicts the project will be complete by the fall of 2018. READ MORE: At the end of last month, the 4th Circuit Court of Appeals struck down two important decisions that allowed the Mountain Valley Pipeline natural gas line to cut through the Jefferson National Forest this past Friday. 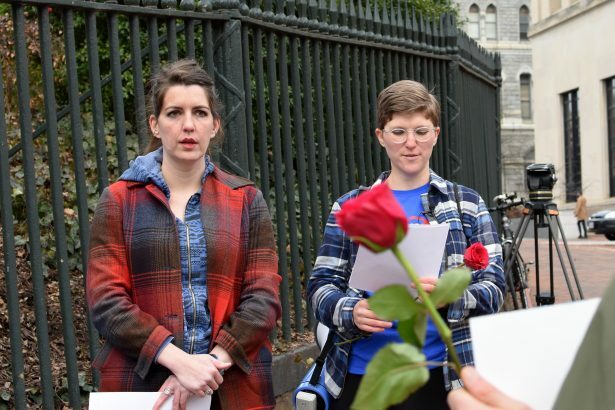 On a chilly Valentine’s Day morning, protesters gathered outside of the Governor’s office to oppose the Atlantic Coast and Mountain Valley Pipelines. 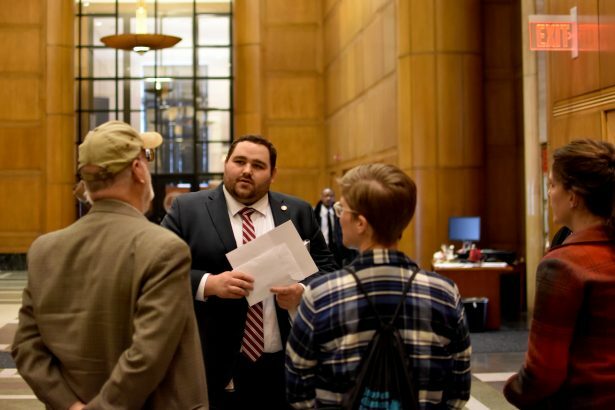 While there were only seven in attendance, they carried with them dozens of letters from those who oppose the pipelines, but were unable to travel to the capitol or take time off work. “I don’t know about y’all, but I’m tired of being insulted by this governor with ridiculous statements like these,” Lovelace went on to say. 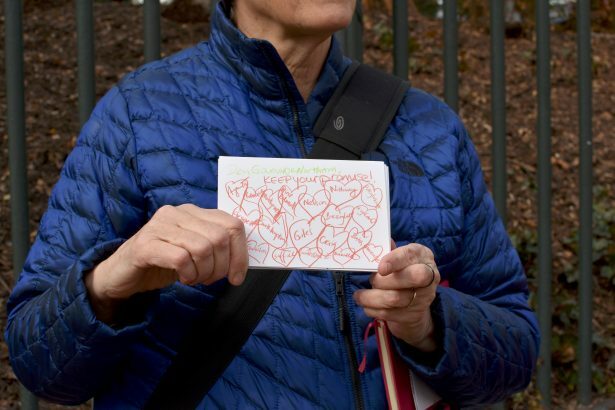 After the remarks, the group chanted and sang, before delivering a sachet of postcards and a letter, which asked the governor to take several concrete steps. They asked that construction preparations and the felling of trees cease until the state has finished its certification process for the pipeline. Along two sections of pipeline, construction workers have already begun clearing sites. They asked that the citizen appointed State Water Control Board’s oversight be reinstated. They argued that this board was the body which legally ought to have oversight and not the politically appointed DEQ. They asked that public input to the Water Control Board be allowed before the already approved but delayed certification becomes effective. They demanded that he bolster his opposition to offshore oil drilling by also opposing fracking. One protester pointed out the basic hypocrisy of opposing offshore drilling when it affects his own tidewater backyard, but supporting fracking which threatens the water wells, air quality, and backyards of the rest of Virginia. They also demanded that Northam rescind a secret agreement reached between ACP and the McAuliffe administration. The Memorandum of Understanding was signed in December, but only discovered after North Carolina announced they’d made a similar agreement. Under the memo, the pipeline companies agree to pay $57,850,000 for mitigation of unavoidable damage to the state’s water and forests. In return, critics say, the state has provided ACP with a liability shield that protects them from lawsuits. Writing at Blue Virginia, environmental activist and lawyer Jon Sokolow accused the state of allowing Dominion Power to “buy their way out” of paying for damages caused by the pipeline. “Terry McAuliffe gave Dominion a full and complete release from any and all damage to Virginia’s forests and water from the Atlantic Coast Pipeline,” he wrote. Sokolow argues that North Carolina’s memo creates greater protections than Virginia’s because North Carolina reserved the right to sue pipeline operators for damages, while Virginia’s agreement does not. As we’ve reported before, people in vulnerable rural communities are losing their livelihoods and homes to this pipeline. Under this memorandum, their communities could be devastated by a leak or spill, and have no legal recourse to sue for damages. Critics say that it’s no longer just the people directly in the path of the pipeline who are now in danger, but every community nearby or downriver. Though small in number, the protesters sought to magnify the voices of those very communities. The letters they brought with them bore names and addresses from across the commonwealth. And they’re concerned about communities beyond their own, and beyond Virginia. Flint, Michigan and the threat the Dakota Access pipeline raised to native communities both weighed heavily on the minds of the protesters. The protesters will reassemble on Wed., Feb. 28, at 10 AM behind the Governor’s office, and have said that their weekly protest will continue indefinitely until their demands are met. This story has been corrected. Lovelace’s quote was attributed to Sims and Jon Sokolow and Governor McAuliffe’s names were misspelled, and the lede was updated to add the Mountain Valley Pipeline.